This city of around 10 million people is a vibrant Southeast Asian metropolis located in the South of Vietnam. We love this city because of its contrasts between old and new, the relaxed people and the fast moving businesses, and between local traditions and international trends. In the past Saigon was first the capital of Cochinchina and later of South Vietnam. Following the fall of Saigon in 1975, the city area was extended and Saigon was renamed Ho Chi Minh City to honor North Vietnam's revulotionary leader Hồ Chí Minh. Even though Ho Chi Minh City is correct, the two names are still used interchangeably. Saigon is sometimes also used for the downtown area of District 1 and 3 rather than the entire city. How to get here and move around? Fly to Tân Sơn Nhất Airport, a 20 minute ($6) taxi ride North of the city center. Forget busses and instead rely on Mai Linh Taxi or Vinasun Taxi to transport you around the city. We recommend not using any taxi company but these two, and beware of copies, especially in the backpacker area. 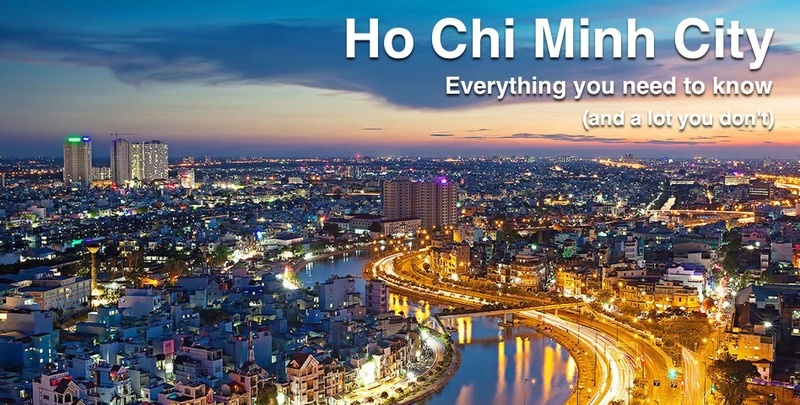 Ho Chi Minh City is divided into 24 districts (19 city districts + 5 rural districts) with District 1 as its center. The easiest way to get to the right place is to have an address or intersection written down. Essentially there are two different areas where most people stay when visiting; Phạm Ngũ Lão, the backpacker area where every night is a Saturday night, and services and restaurants cater to the needs of backpackers and budget travelers, or the more family and business friendly Central Business District around streets Đồng Khởi and Nguyễn Huệ, where you find everything from mid-range hotels to good value luxury hotels. Both of these areas are located in District 1, and due to the easy access to the city's airport and the low cost of taxis, there is really no reason not to stay in the city center. If you want to see the city in a traditional way, we recommend taking a cyclo tour starting at Bến Thành Market where you can also pick up some souvenirs. Remember to bargain both at the market and with the cyclo drivers. It is a good idea to head to the Notre Dame Cathedral for some sightseeing and perhaps a coffee on one of the side streets or in the park. There are many museums, galleries and pagodas around town. The most popular attractions are probably the War Remnants Museum, Vĩnh Nghiêm Pagoda and the Củ Chi Tunnels. After a long day of sightseeing or shopping at the markets, shopping malls and streets, ending the day with a massage at one of the many spas is a great way to recover just in time for the Ho Chi Minh City nightlife. Ho Chi Minh City is an excellent destination for people who like to sample both local and international cuisine. Phở, a noodle soup normally served with beef, is the most famous Vietnamese dish, and many locals will tell you that the very best one can be found at Phở Hòa. A lot of eating and drinking in HCMC takes place on the streets. Here you will find Cơm tấm, broken rice which is normally served with a grilled pork chop and a spicy sauce, and Chè, a kind of sweet soup dessert often made with coconut milk and banana or green beans. Due to the tropical climate, the local favorite drink is definitely beer, often served with ice. Try a glass of Vietnam's fresh beer Bia hơi for around 4000₫ ($0.20) or a bottle of Sài Gòn Đỏ for a few times more. Ho Chi Minh City is a city to enjoy by eating well and observing the relaxed, but slightly chaotic life in one of the world's megacities. Notre Dame Cathedral 1 Công Xã Paris, D. 1 The cathedral is a famous landmark in the city center. Bến Thành Market Chợ Bến Thành Lê Thánh Tôn, D. 1 The most famous and tourist friendly market with a rich history. Củ Chi Tunnels Địa đạo Củ Chi Địa Đạo, D. Củ Chi The famous tunnels where soldiers lived and fought. Vĩnh Nghiêm Pagoda 339 Nam Kỳ Khởi Nghĩa, D. 3 Popular pagoda for its remarkable ancient Asian architecture. War Remnants Museum 28 Võ Văn Tần, D. 3 A museum showing the horrors of the American War. Phở Hòa 260C Pasteur, D. 3 Possibly the most popular Phở-restaurant in town.